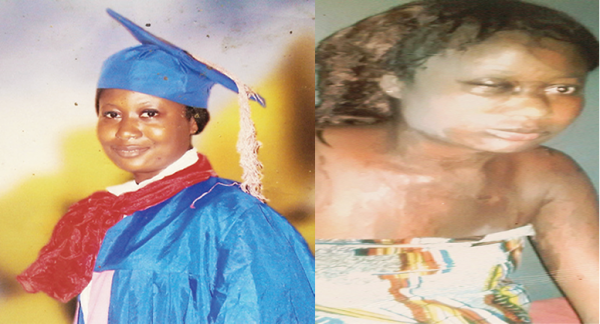 Police detectives in Lagos have arrested a man for allegedly bathing his former lover with acid after she jilted him. Although nobody was sure that the person who bathed the victim, Rosemary Nanaifa, with acid was her former lover, but the lady said she was sure. According to Nanaifa, 23, her former lover, Paul Nwokobia, whom she dated for five years, had repeatedly threatened her since she dumped him. She said she never knew he would go to the extent of bathing her with acid. Speaking from her hospital bed at the Female Surgery, Ward B, University of Lagos Teaching Hospital (LUTH), Idi-Araba, Lagos, Nanaifa, a caterer, said the incident happened on June 3, around 8pm. The matter was reported at Itire Police Division. She said: “I was at work one day when a private number called me around 4pm. The caller was a lady. She said she wanted me to bake cake for her. She said she would call back in the evening.” According to her, the woman called around 8:30pm and told Nanaifa to meet her at Surulere. She said she would be in a red car. She said: “I was wearing a red blouse too. When I got to the spot, I did not see any red car and she was not calling back. Suddenly, I noticed someone drew my hair from behind and suddenly poured acid on my face down to my waist.” As she felt the debilitating pains, she fell to the ground, screaming in pains. People later rushed her to the hospital. They also alerted her family. “When it happened, I couldn’t see very well, but I’m sure it was a man. The man fled the area immediately.” Nanaifa left her boyfriend last September, and since then, he had been threatening her. She said: “I didn’t know his plans. I left him because he did not have a stable job and he wasn’t honest. I decided to move on with my life.” According to her, her family had spent over N200,000 on her treatment. She said that she went to work at a factory after her secondary school. “There’s no big deal in jilting your lover. People do it every day. I didn’t expect Paul to have gone to that extreme. I was the one who led policemen to his house. He did not suspect we would trace the incident to him.” When contacted, the state Police Public Relations Officer (PPRO), DSP, Kenneth Nwos, said the suspect and three others had been arrested and taken to the State Criminal Investigations Department (SCID), Panti, Yaba, for further investigation.